How to pump up the flavor by drinking different varieties of beer. I've found that one of the best ways to enjoy a variety of beers in one session is to go with contrasting flavors, one after the other. It keeps your tongue from getting bored and sharpens the palate. One of my favorite counterpoint combos is Pilsner and IPA. The hops in a traditional Pils alter the tongue just enough to make the IPA's hops explode in the mouth (in a good way). Try it, you'll see. This week's selections aren't nearly that simple, but the differences between these two new beers are guaranteed to bring out the best in both of them. 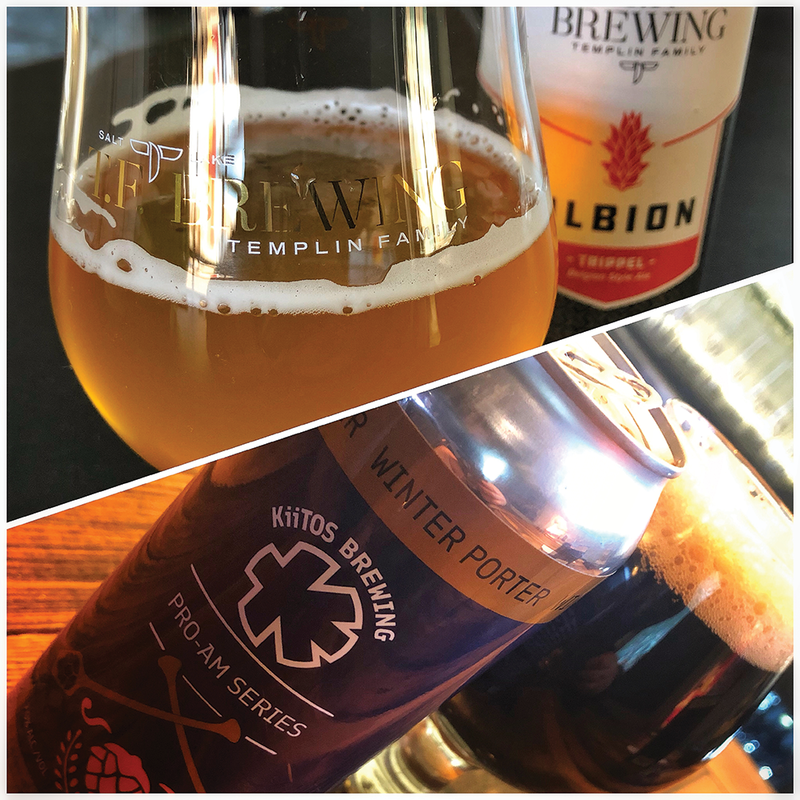 Kiitos Pro-Am Winter Porter: This is the first of Kiitos' Pro-Am Series of beers. This 7 percent ABV porter is brewed with coconut, coffee and cocoa nibs in collaboration with Salt Lake City homebrewer Andrew Frost. Frost's Frosted Morning Pow Porter won a gold medal at the Beehive Brew-Off, Utah's preeminent home-brew competition last year. The Pro-Am beer is black with a subdued nose, showcasing mostly vanilla and roasted malt. Once in the mouth, bittersweet baker's chocolate comes through at first, while the middle adds a small dose of caramel and coconut. These flavors play well with the cocoa from the top of the taste. Muddled coffee and light cream (which might be the coconut sweetness) round out the end. The beginning is solid, but the middle through the end is a little confusing and hard to dissect. The best part of the flavor is the lingering aftertaste, where big notes of dark chocolate combine with the mildly bitter coffee grounds along with a lingering, soft nuttiness. This beer gets much better as it nears room temperature; the coffee flavors become more pronounced and seem to smooth out and meld more completely with the rest of the beer. Overall: The drinkability is good for a 7 percent porter. There's no discernible alcohol; the flavors end up coming together nicely after some warming and are interesting enough to keep me coming back again and again. Templin Family Brewing Albion: This has a golden cantaloupe color with eggshell white foam crowning a couple of centimeters above the ale. The aroma is fairly bold; its sweet and spicy yeast character helps define the pineapple, banana and peach that emerge from the alcohol-laden beer. Since the aroma was so great, I thought I'd take a bigger-than-normal swig; 10.2 percent ABV isn't exactly below my swigability threshold, but the experiment allowed me to take notice of the whole package. The taste starts with flavors of stone fruit—mostly peach—then quickly transitions into bubblegum and peppery clove-like yeast. As the beer warms, some honey and darker fruits make an appearance. Some hops provide a little balance, and some of that peach and pineapple from the nose come through to round it out. It's solidly sweet through most of the sip, with a drying finish, though it remains on the sweeter side. The contrast from start to finish, though, creates a slight puckering. Overall: This is one of the better tripels I've had in a while. It's not overly complicated with extra spice additions and relies only on the malt, yeast and a good dose of Belgian candy sugars. The booze is well integrated, and many traditional tones come through. Both of these beers shine in 16 ounce cans, and both are finding fridge space in bars and restaurants all along the Wasatch Front. However, going to their respective sources will ensure the best drinking experience. As always, cheers!